I would like to tell you my small every day trading advice regarding placing the order to trade software of your online broker. Every internet stock trade that is prepared in advance by trader should be well managed. This management includes especially entering of market trades when stocks are bought or sell short in bearish type of trade. Second important type of trade management is protective stop loss placement for already opened positions in your brokerage account. This free advice is about using stop loss orders for purposes of trade entry or during every day trade management process. When the trade is managed then stop loss orders play protective function against big loss. The trailing stop loss technique also helps to achieve best possible trade result as trade moves into our favor. I received this advice some time ago, and it is now a very important part of my trading strategy. I am not sure if it is best stock market advice I received during my stock trading career that is already more then 10 years long but I can confirm that it surely improves results of my stock trading strategies. I use it every day. One trading veteran told me that it isn’t good to enter stop-loss orders or a position entry order before the market opens. This advice means that a lot of amateur investors place their orders before market opens. Most of these orders are based on some “hot stock pick advice” or some ”hot news” received during pre-market hours. It creates a huge opportunity for market professionals to profit from these orders. It’s very common that such news moves share prices during pre-market hours already, and stocks open with a gap (the price is much different from yesterday’s close price). It means that stop-loss orders or trade entry stop orders of these amateur investors are often filled in at a totally different price from what they expect. And after the first few minutes of trading, when all these orders are filled, the price returns to the previous day’s close levels. It happens almost every day. I’ve seen it a lot of times during my trading career. So, I think that this advice for online trading is very important. Do not enter any orders that are to be filled after market opens before the market opens. Wait 5 or 10 or 15 minutes and then enter your orders. Adjust stop-loss levels or trade entry levels accordingly. 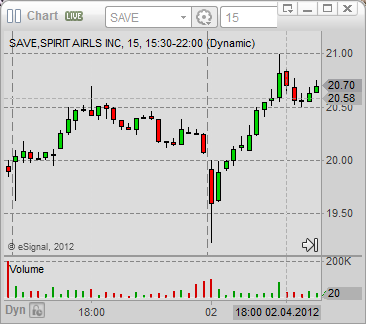 Here I provide the intra day chart of SAVE shares. The 15 minute period intra day price chart of SAVE shares shows that share price opened under previous day closing share price value. Then price moves down a little bit only to reverse its movement and close on its daily highs. It is a typical example when this every day trading advice shows its importance.